Here you'll find a few of the products we offer for high school seniors. If there is something you'd like to order, but don't see it here, please ask us. We have access to the best designers and photo labs in the country. 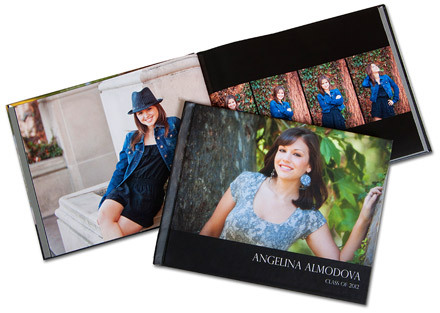 These 3x3 mini albums are the best way to show off your awesome senior portraits! Give them to grandparents, best friends, or aunts and uncles. Don't just order one because everyone will want one!! Each accordion is printed on heavy gloss stock and contains images on front and back, giving you room for 12 images (including covers)! 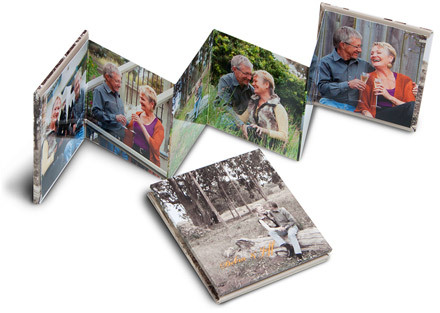 Cardboard covers are wrapped with the photos you choose and contain a hold-tight magnetic closure. Our Coffee Table Book contains your favorite pictures in a custom designed book. This 8.5 x 11 press printed book with lay-flat pages and hard bound cover, will be the keepsake that will last a life time. There isn't a better way to remember your senior year than this beautiful, high quality book that tells the story of your senior year. Our Designer Book is custom designed, just for you, by our own album designer. 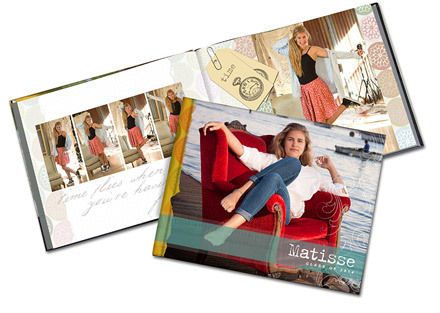 Pick from several themed layouts and enjoy your personalized book forever! Your one-of-a-kind, 8.5 x 11, press printed book comes with lay-flat, UV coated pages and a hard bound cover. Have all your guests sign it at your graduation party and it will truly hold a life-time of memories. 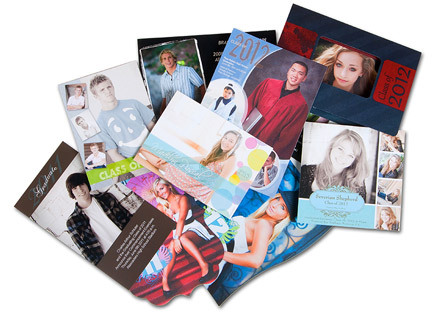 We offer a large selection of standard photo announcement cards and custom, Studio 101 West designed, graduation announcement cards. Our custom designs are unique, two sided cards that you won't find anywhere else. They are created especially for you by our in-house design department. All of our cards come with envelopes. The bling doesn't get any better than this! Here is a photo key chain of your senior that both mom's and grandma's are guaranteed to love. 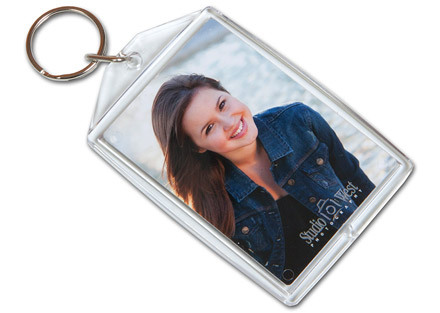 These sturdy key chains are double sided acrylic and hold two wallet size pictures. They come complete with metal hardware and are made to last and look great.